Triathlon sports that involve three consecutive disciplines, usually swimming, cycling, and running, are some of the fastest growing sports activities. 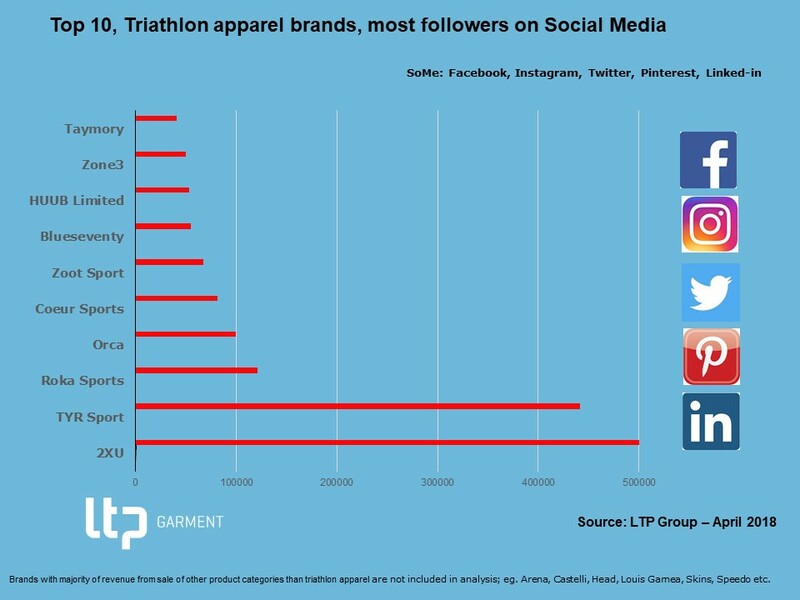 LTP Group has prepared a Social Media (SoMe) analysis of all triathlon brands comparing their number of followers on the largest SoMe platforms; Facebook, instagram, Twitter, Pinterest and LinkedIn. The American triathlon brands dominate the list with four brands in top 10; TYR Sport, Roka Sports, Coeur Sport and Zoot Sport. 2XU from Australia has the highest number of followers - but also British brands have two brands in top 10; HUUB and Zone 3. 66% of the triathlon followers are using facebook as their SoMe platform, 24% Instagram, 8% Twitter, while Pinterest and LinkedIn only have very few followers. "We see an increasing number of triathlon brands asking us to develop and produce their triathlon apparel brands", tells CCO Alex Ingildsen from LTP Group. Alex continues, "We are already developing and producing garments for a lot of bike apparel brands (eg. POC, Vaude, and Pas Normal Studios), so it is natural for us also to enter the triathlon segment". HUUB, who is the eighth most followed triathlon apparel brand has just started up with LTP manufacturing tri suits, shorts and tops. The collection is produced in the innovation center in Lithuania using the newest technologies within bonding, glueing, and printing. "Our aim is to create better products combining research, science and reality," tells founder Dean Jackson. He continues, "HUUB has four decades worth of experience gained in the field of endurance sports". HUUB is not a slave to fashion, but to form, fit and performance. We believe quite simply that we have delivered what contestants want. What´s more, we know our suits work, because the science says so. The HUUB team understand the specialist technical and scientific fields associated with triathlon, including hydrodynamics and swim stroke analysis. We are focused on bringing cutting edge innovation to our products, whilst retaining a sense of reality and accessibility. Feel free to contact CCO Alex Ingildsen - ali@l-t-p.com, if you want to be informed about the rating of your triathlon apparel brand.